On January 29, 2001, Jeffery Ben went missing from Pushmataha County, Oklahoma. Ben's vehicle was located shortly afterwards on Nine Pine Road northeast of Clayton, Oklahoma. 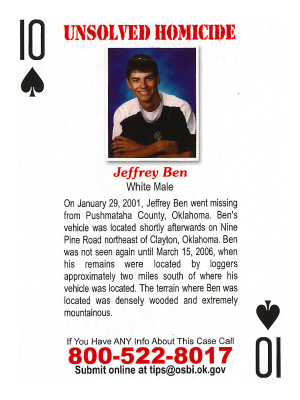 Ben was not seen again until March 15, 2006, when his remains were located by loggers approximately two miles south of where his vehicle was located. The terrain where Ben was located was densely wooded and extremely mountainous.